The guests you invite to your wedding play a crucial role in making your day spectacular. While your wedding is a big day for you and your significant other, it can also be a momentous occasion for many of your family and friends who have loved, cared, and supported you as individuals and as a couple. Despite wanting to invite everyone and anyone who has touched you and your soon-to-be-wedded spouse’s lives, it isn’t always feasible. You must consider a number of factors and inevitably cut some people from your list, which is why this often becomes one of the most difficult tasks in the wedding planning process. The size of the venue. Determining the number of guests can be made a little easier if you use your venue’s maximum capacity as a gauge. Budget. It is not the most romantic nor fun discussion to have; however, it can quickly determine how many guests you can afford to invite. Your magic number. 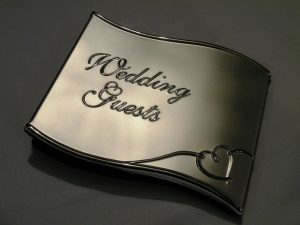 Most brides have an ideal number of guests they would like to include which provides you with a good starting point. Before you begin compiling a list, you should come to terms with the fact that it’s very likely that not everyone will make the cut. You should also know that you will not be able to please everyone; there’s a good chance someone at some point will get upset. When my husband Bernard and I were starting this process, we made a list of who we wanted to invite, and we asked our parents to do the same. Our magic number was 130 guests, and I was surprised at how quickly we reached that number once we started listing people to invite. We categorized our list by, “Must” and “Would be Nice” then distributed the guests accordingly. The headaches began when it came time to start eliminating people. Each guest we wanted to cut from one of the lists, was met with opposition. It felt like many guests were clumped together; if we invite person A then we must include person B. We also found that every time we seemed to be making headway in eliminating people one of our parent’s would remember someone they forgot to add. When we finally sent our invitations, our guest list had reached a total of 230 people − just twenty shy of our venue’s maximum capacity. Our wedding was a blast, and I attribute a large part of that to the guests who were in attendance. Still, in hindsight, I feel Bernard and I could have done a better job of controlling the number of guests we invited and the stress the guest list caused. 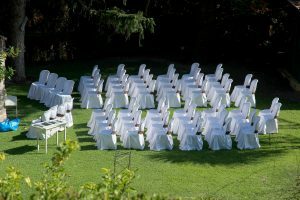 I found on The Knot a fantastic article by Simone Hill giving excellent tips for making your wedding guest list – many of which I wish I had read before our wedding. I encourage Brides to check out the full article, but I want to highlight specific tips she mentions that I believe to be vital. “Make some cutting rules (and actually follow them).” Bernard and I didn’t set rules; therefore our parents included many people with whom we hadn’t interacted with in years. If we had given our parents some criteria around who to invite, we could have saved ourselves a good deal of debate over eliminating particular people. “Include names on the response cards.” Bernard and I paid close attention to how we addressed the wedding invitations to make sure we did it accurately, and so there would be no confusion as to who was invited. We were surprised at how many people, particularly our older guests, tried to add additional people to their invite. By writing exactly who is included on the response cards, you save yourself from the awkwardness of having to call and tell guests they cannot bring their add-ons. “Avoid last-minute additions.” Underneath her point, Hill discusses the people you encounter when planning your wedding who assume they will be invited to your wedding when in fact they will not. You will find that some people, whether intentionally or not, will make innocent comments like, “Your wedding is going to be so much fun, I can’t wait” which sometimes feels as if they have cornered you into inviting them. Hill encourages brides to develop a response to these types of comments that is clear and to the point, and that will save you from having to commit to an invitation. My mom and I came up with a response later after we had already given committed responses to several people, which made it much harder to cut them later. The guest list can be a complicated piece of the planning process. However, using these helpful tips can cut down on the conflict and stress you encounter when it comes time to sort out your final list. This entry was posted in Brides and tagged budget, invitations, list, Marriage, venue, wedding, wedding guests, weddingplanning.